BARCELONA, Spain – Juventus put on a masterclass of defensive football to reach the UEFA Champions League semifinals on Wednesday, frustrating Lionel Messi and earning a 0-0 draw against a Barcelona side hoping for another miraculous comeback. The second-leg stalemate sealed a 3-0 win on aggregate and came six weeks after Barcelona’s historic 6-1 thrashing of Paris Saint-Germain, when the home side became the first team to ever overturn a 4-0 loss in the competition. The Italians visitors made sure there would be no more miracles at Camp Nou by displaying all the poise and experience that PSG had sorely lacked in the previous round. True to the Italian tradition of defending an advantage, goalkeeper Gianluigi Buffon had little work to do until late in the game, as Massimiliano Allegri’s side expertly absorbed Barcelona’s passing attack that ultimately produced few good scoring opportunities. And when Messi did get free inside the area, Barcelona’s all-time leading scorer squandered both his chances to spark a fightback. The only miracle seen in Barcelona this time was Juventus not getting a late goal, with the Spanish side barely having the legs to recover when defending. Barcelona forward Neymar was consoled by former teammate Dani Alves, now playing for Juventus, after the final whistle while Barcelona’s fans cheered their team despite the elimination. Juventus joins Real Madrid, Atletico Madrid and Monaco in the semifinal draw on Friday. Monaco advanced after beating Borussia Dortmund 3-1 in its quarterfinal, second leg on Wednesday for a 6-3 aggregate win. Teenager Kylian Mbappe and forward Radamel Falcao struck early to put Monaco on its way. Dani Alves committed the only slip in Juventus’ discipline when he was caught off the pitch at kickoff saying `hello’ to his former teammates in Barcelona’s dugout. Fortunately for the Brazil right back, the opening move planned by Barcelona to send a long ball into his defensive zone flopped. Otherwise, the same Juventus starting 11 from the first leg had control of the match, bending but never breaking under the assault of a Barcelona in full-attack mode. Messi could have boosted Barcelona’s hopes in the 19th minute when a long buildup ended with Luis Suarez setting him up near the penalty spot, only for Messi to fire wide. Neymar volleyed Jordi Alba’s pass wide before Messi drew the first save from Buffon just past the half-hour mark. Juventus, however, tightened its defense, anchored by Bonucci and Giorgio Chiellini, and the hosts’ opportunities dried up. 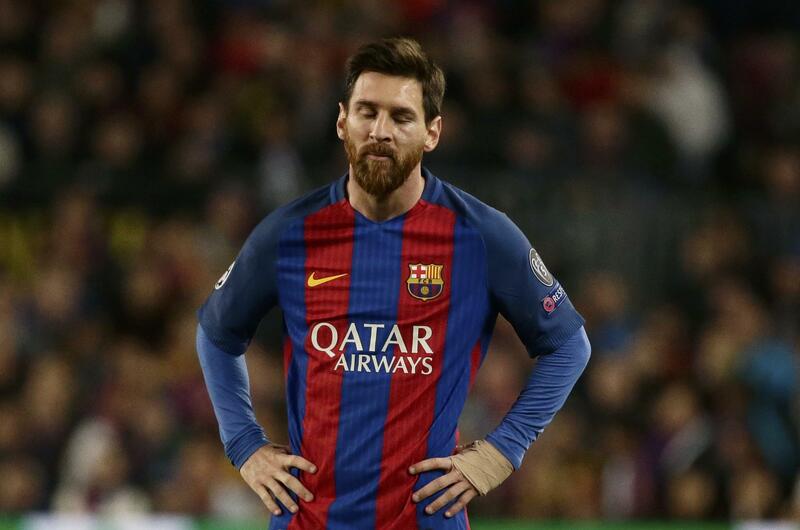 Messi’s first half had a painful ending when he was caught by Miralem Pjanic while jumping for a ball. Messi tumbled face first into the turf, and showed a small scratch that bled on his cheek once he got back on his feet. Neymar was then booked for an apparent retaliatory charge into Pjanic, earning him a one-game suspension for accumulation of yellow cards. Messi wasted another opportunity in the 67th when Suarez found him in the box after Buffon left his line and failed to clear the ball. Andres Iniesta finally gave Buffon a real challenge with 10 minutes remaining, when his glancing effort off a cross made the veteran goalkeeper get down low to save. Juventus will be without midfielder Sami Khedira for the first leg of the semifinals after he earned a yellow for fouling Suarez. The two-time European champions are set to complete an excellent campaign. Having now avenged their 2015 Champions League final loss to Barcelona, Juventus also leads the Italian league and has lined up an Italian Cup final against Lazio. The result ended Barcelona’s run of 15 wins in as many home European matches since the arrival of Luis Enrique, who will leave the club this summer. Barcelona must now rest and regroup for Sunday’s trip to play Real Madrid in a “clasico” match that will go a long way to deciding the Spanish league title. Published: April 19, 2017, 1:47 p.m.